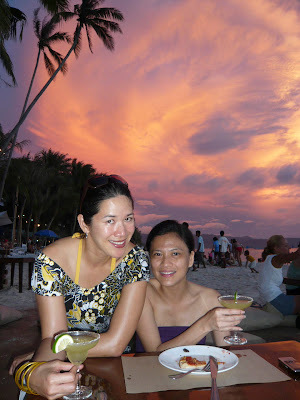 It was unlike any other Boracay trip I've had. For one, we were nowhere "close" to white beach. Second, we didn't even touch the water. And lastly, we ate in most of the time. 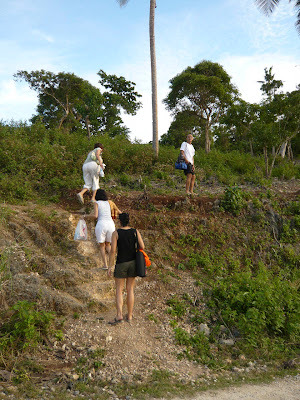 Heading to and from white beach from my brother's condo unit was no easy task. Trikes have difficulty climbing the hills to his place. Arrangements have to be made with the condo driver for pickups and drop offs. 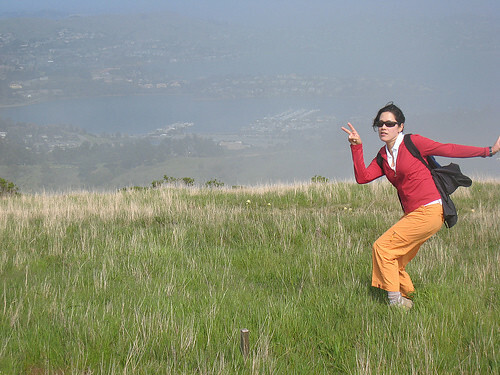 Plus you need to hike a short but steep hill to get to the multicab. No big deal really, but it may be for some. Nipa Hut. 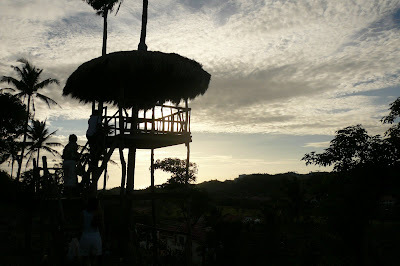 My brother took us on a 20 minute hike to his nipa hut for cocktails. 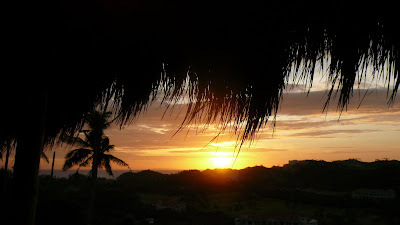 We watched the sunset and were chatted up by Efren, a local landowner, who joined us in our festivities. We were there for a couple of hours, enjoying the view and the latest gossip re the Gucci Gang. Tirta Spa. We had a most excellent experience at Tirta. Surpassing my Mandala experience and possibly equaling ShangriLa Mactan's Chi. 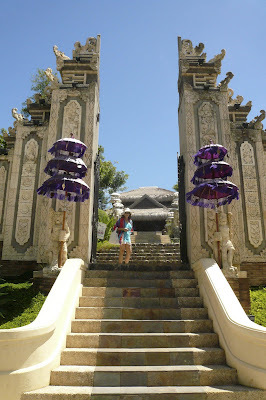 Even before entering the grounds of Tirta, we were awed by its imposing entrance. As we passed the gates, a man struck the gong announcing our arrival. We chatted with the lovely and charming owner, En Calvert. She explained the process that went into Tirta. So much love, thought and detail was poured into it, down to personally training her staff. I picked the Hilot massage (Filipino massage), while my sister had the scalp and the foot reflexology treatments. Mmmmm... if you're in Bora, you've got to check this place out. Extended Happy Hour. For our last night in Bora, we headed over to Aria. We befriended Nicky, the restaurant manager, who agreed to give us happy hour prices all night long on the condition that we crawl out of the place at the end of the night. Umm no, we didn't dare. I love their margaritas, they make it strong! So, that was my last hurrah. I don't know when I'll be able to visit this place again, but I'm already looking forward to it. I can't believe, I haven't ran since I returned from Australia!!! I can already see unwanted changes in my body. It hasn't helped that I've been eating non-stop, like a pig. All the walking and running I did in Australia, plus the long plane ride back to Manila, somehow affected my knees. My right knee was swollen for 4 days, it felt like it had some extra fluid there... But it's all better now. I'm going to have to start running again soon. Thank god my marathon training begins next week! It's great to be back in Manila, where the weather is surprisingly cool and breezy. A bit jetlagged, even though there's only a 3hr difference between Sydney and Manila. Will be flying to Boracay this weekend before to the Holy Week rush. Yippee, this will definitely be my last hurrah before returning back to California. That being said, I'll be quite busy the next few weeks, preparing and packing up the bulk of my stuff, doing the goodbye rounds and what nots. I don't know when I'll be able to update and post pictures of my trip to this blog. Hopefully I'll find some downtime in Boracay this weekend to do so. So until then, happy and safe runnings to all. It was an easy and unstructured day. Did an early morning run around Hyde Park, Circular Quay, Sydney Opera House, Royal Botanic Garden and Central Station. After a late breakfast, planned to take the ferry to Watson's Bay then head over to Coogee, but decided to explore the surrounding neighborhoods instead. Walked around the Surry Hills and Darlinghurst areas, discovering cool little streets filled with cafes, little design and boutique shops. Just my kind of thing. Then headed over to Darling Harbour to scope out my route for tomorrow's run. Early morning run around Tumbalong Park, Darling Harbour and crossed the Pyrmont Bridge. Last minute shopping at Kinokuniya bookstore, Woolworths, Sportsgirl and Paddy's Market. 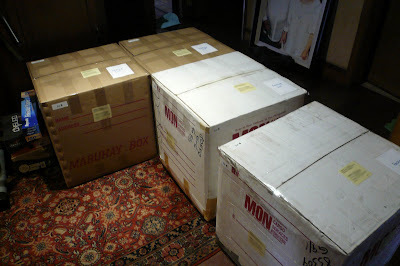 A lot of salivating over Australian designed items especially the Sheridan linens and Japanese/Eastern inspired clothing. Evening flight out of Sydney back to Manila. That concludes my trip to Australia. Cruised along Sydney Harbour via Majistic Cruise Smart. Awesome 1 hour cruise! The Rocks Walking Tour. History and other interesting facts about The Rock and how Sydney was discovered. Sydney Wildlife World. A waste of time, except that I saw Koalas for the first time. Half day City Sights and Manly Beach Tour. Nice wide beaches over at Manly, but I prefer Bondi Beach. Surf was too strong, so not a whole lot of swimming allowed at Curl Curl. Great Chunky Beef Pie at Hamlet's at Corso. I'm loving meat pies. Must find a place in Manila! Halfway stroll of the Sydney Bridge, also called a coat hanger. Great day, hardly any wind. Walked up Sydney Bridge Pylon for 360 degree views of Sydney. Spectacular panoramic views, better than Syney Tower without the distracting glares! The Sydney Opera House Essential Tour. Incredible architecture and interesting commentary by Charlie, the tour guide. Watched a movie at the Dendy, The Diving Bell and The Butterfly. Thought I made the wrong choice, but ended up liking this French film. Very original story. Sydney Aquarium. It was really awesome to see the sharks swim all around and over me!!! Breezed through the Aquarium, other things that stood out were the little penguins and the colourful reefs ~ that's as close as I'll get to the Great Barrier Reef. Took Monorail back to hostel. Woke up at 6:45am to catch the 7:25 train ride to the Blue Mountains. It takes 2 hours to get from Sydney Central to Katoomba. Purchased the Blue Mountains Explorer Hop On/Hop Off transport to get around. Did a 2hr hike from Skyway Eastern Anchorage all the way to the base of Scenic World. Took the Railway all the way back up. That's the steepest rail I've ever seen! Did another hike from Honeymoon Lookout all the way down the Giant Stairway, that's 890 steps going down! I did a freaking 1780 steps! Never had my heartbeat beat so hard. I was ready to walk another 2 hours to the Railway to avoid climbing the stairs, but I lacked the time! Caught the bus at the Echo Point - Three Sisters to Leura Village. Devonshire Tea at Bygone Beautys. How very delicious and proper. They had over a thousand teapots on display! Caught the 3:24pm train back to Sydney. What a day! Coastal walk from Bondi Beach to Coogee. Stunning views!!! Gay & Lesbian Parade back on Oxford St. Similar to the Berlin Love Parade. Tried an Aussie delicacy called chiko roll, a chicken in a roll. The one I tried was disappointing. Also tried a scone with cream and strawberry. Now that was really yummy! Daytrip to Tumblegum in New South Wales for Devonshire Tea. Scenic roads similar to Marin coastal roads and Sonoma hills. Stayed at my aunt and uncle's brand new condo. They have an awesome beach front unit on Palm Beach. Spectacular 280 degree views of the beach! Lunch at Goldsteins. Really good steak pie with mushy green peas!!! 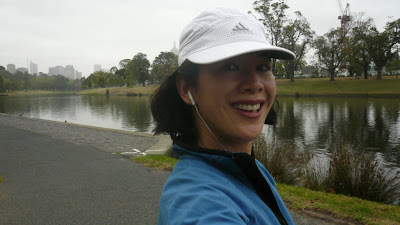 Ran along Yarra River ~ drizzly but an awesome run!